If you are not already a member, we could use your support. You can get information on joining by clicking here! You don't need to be a member to help out and make a donation to the Taylorcraft Foundation. We accept online payments via PayPal. Flyin Taylorcraft, Aeronca and Funk: Barber Airport (2D1) Alliance, Ohio. See the Calendar at our discussion forum for dates and details. 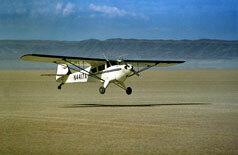 The Taylorcraft Foundation (TF) does not project or accept any responsibility for participation by any Web site or newsletter reader, member, customer, contributor or groupie at any fly-in functions, forums, or events that may be publicized by newsletter, web site, email, email list, sky writing, newsletter or any other method. All material herein of a technical nature is for reference and historical use only and is not necessarily recommended or approved by the editor of this web site, TF and its officers and board, unless specifically stated. It is up to the individual reader, his/her Certified Aircraft Mechanic, Government agency, and the Sky Gods to determine the legality and veracity of anything appearing within TF Internet media such as web pages, newsletters, email mail lists, and email. This Internet media is produced only as a medium of communications amongst owners/aficionados of Taylorcraft aircraft and history. Make your own decisions, and take responsibility for your own actions.